>>>I am a fan and listener of the 60's oldies music. I used to listen to the UK Top 20 as released by the New Musical Express. I was very fond of a nice song of which I only remember some of the lyrics. I am in search of its title and the name of the singer. After writing down the following lyrics, I wonder if you can be of any help. I studied Shakespeare when I was in school, thought Romeo was a joy. I like the true way he loved Juliet, it was my ideal of a boy. Romeo, why am I so in love with you? Romeo, is it you or the thing you do? Are you mine from the moment you said hello ... are you mine or just bluffing my Romeo? The song with the references to Romeo was titled "Romeo" by Petula Clark recorded in 1961. You seem to know a lot about the older music. I am 46. When I was 13, my mom had a 45 and on the flip side of what she listened to was a song I loved. It was about a woman who had lost her love / spouse. She talks and sings in this song. I met someone not so long ago - oh, I think you would have liked him. I can't call him baby, my baby. You were the only baby, my baby, for me. I have been looking for this for years ... do you think you could help me??? While doing a Google search for information about the band Horatio, I stumbled upon your post where Clark Besch talks about their version of Jim Croce’s song “Age” and makes the suggestion that it may just be Cashmen, Pastelli and West under another name. Attached is the sleeve to the 45 rpm of the song and another song they did and, as you can see, it’s not a trio but a group who sang the song. 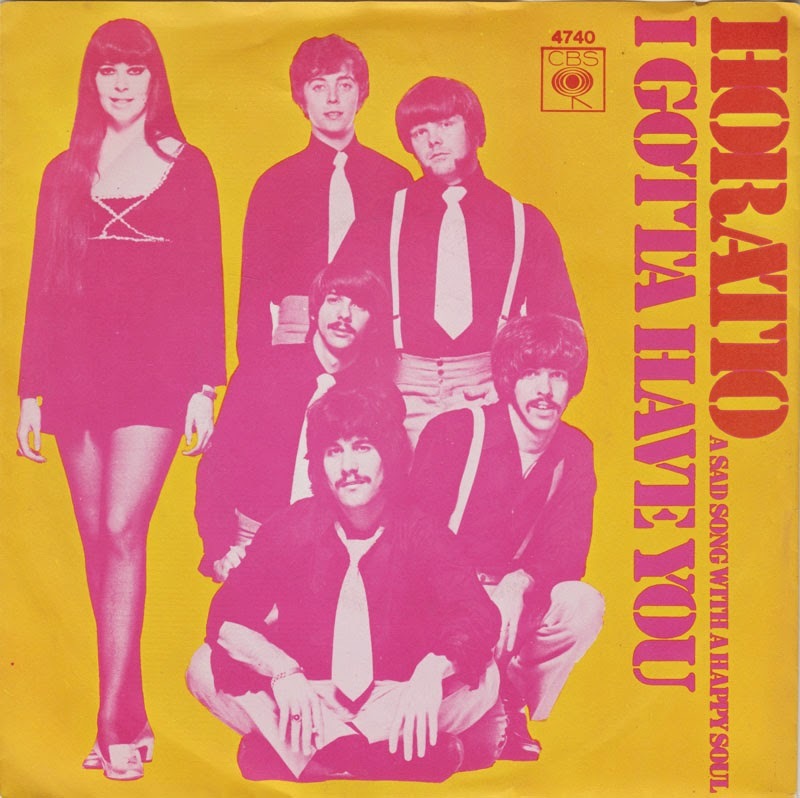 The song charted on Billboard in July 1969 at #119, but I’ve not been able to find any other info about this band. Any clues? If anyone would like any more info on Birdlegs & Pauline (as mentioned in your column by Phil Nee), they're in my books. Seems to me there was another club in Elgin called The Lottery that had bands and booze so maybe that takes it out of teen clubs. Also there was a Mousetrap Club for a short while in Elmhurst ... either on a Lake Street or the Frontage Road ... was about a half mile east of Coffee Break and believe me the clientele did not mix with each other. I cannot believe the Riddles played there ... I thought they were loyal to the CB. A long time back I tried to have a song identified with text lyrics only to no success. I want to give it one more shot using the clip of the song I taped off the radio nearly 40 years ago on CKLW in Windsor-Detroit. My guess is this is a minor / regional hit which helped satisfy CANCON requirements. Any ID on the song and / or group would be appreciated. I was looking for two songs and you had one: 7-up [the only good one, #38]. The other one I wanted was "Lemon Up". It was sung in a soft voice reminiscent of the 1910 Fruitgum Company or the Ohio Express. All I remember is ... "We've got the juice of one whole lemon in lemon up". I loved the song except for one thing: the singer was one of those people who couldn't pronounce the short "e" properly if you spread it on his tongue and clapped him on the back. He kept singing "limmon", for which I have no patience. I tried finding the songs on-line; I thought they'd be on a site like youtube, but, no such luck. Ok ... now I have 765 stickers from USA, Canada, Australia, New Zealand, Europe, England including 1980's PIRATE RADIO stickers and promotional items. Also have over 1500 radio station coverage maps all from the early 70's. Think any of your readers might be interested in these? Last night, I watched the classic sci-fi space movie from 1972, "Silent Running", starring Bruce Dern. I've probably seen it at least twenty times. When I saw the flick, as it first hit the theaters, I was pleasantly surprised to hear Joan Baez singing a couple songs on the soundtrack. Her voice is so recognizable. 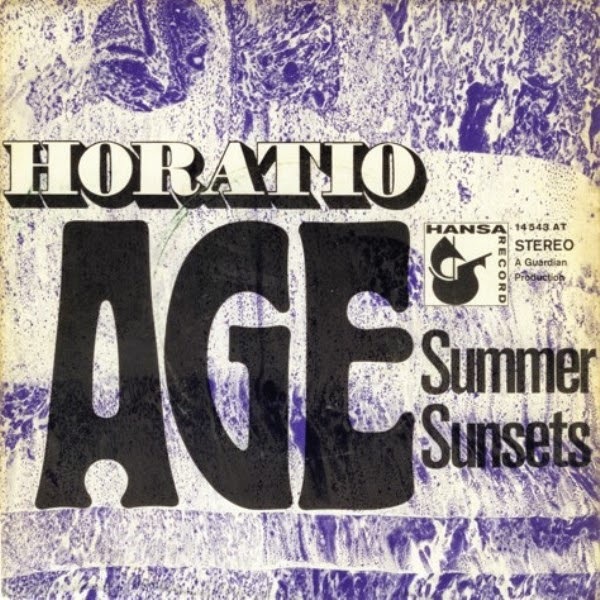 I really liked one of them, "Rejoice in the Sun", but didn't know how to get a recording of it, until years later, when the whole soundtrack became available through Nostalgiphon Records. Before that, I had to resort to recording it, using a reel-to-reel tape recorder, with the mic close to the speaker of my TV set, when the movie was first broadcast. Recently, I have been researching Baez's "Diamond's and Rust", and found out that Decca did release "Rejoice.." and the other song from the movie, "Silent Running", on a 45, back then. I had no idea it was out there, or certainly would have gotten a copy. I'm really surprised that the record didn't go anywhere, because it was on the heels of her big hit, "The Night They Drove Old Dixie Down". Do you have any info on if it charted? I'm from Turkey. Could you please tell me the name of the song? I couldn't find anywhere. Thanks! Can you shed any light on the song that Ray is looking for? I'm sure you have had experiences where you tried to remember a song, an artist, a record from the past, and just couldn't put your finger on it. Well, I've been racking my brain trying to zero-in on a record I played often on the air in the late 1950s. The song title was "Circus." Upbeat, but not rock 'n roll. I think it was recorded by Tony Martin several years earlier, but the version I'm trying to remember / obtain, was by a black-sounding male vocalist ... someone like Billy Eckstine, Al Hibbler or Arthur Prysock. The song was composed by Louis Alter and Bob Russell, and one of the lyric lines is ... "daring young love on a high trapeze, we certainly flew through the air with the greatest of ease ..."
I've been all over the Internet trying to nail it down, but to no avail. Maybe you remember, or know someone who might. Sorry, but I have no recollection of this one at all ... a bit before my time ... but nothing charted during "The Rock Era" with the title "The Circus". I'm happy to put this in our next Helping Out Our Readers segment and see if anything comes back. Using Ray's Tony Martin reference as a guide, I see that Martin charted with "Circus" in 1949 ... it went to #24 on the Billboard Chart. A competing version charted by Bill Farrell. My guess is the black vocalist he's referring to simply covered the song several years later on an LP ... but it was not a hit. I even checked Billboard's R&B Charts for this era and found nothing. I did find a copy of this recorded by Sammy Davis, Jr. ... could THAT be the one he's thinking of? Thanks so much for doing the due diligence on the song. I’ve vaguely remember the song and have passed along your e-mail to Ray. Incidentally Ray was the Production Director at WLS back in the 60’s and created all those wonderful promos for Ron Riley, Art Roberts and the Silver Dollar Survey! Musical Mystery Solved ... See below. Thanks again, Kent, and Merry Xmas! Thanks for looking into this, and thanks to Kent for the info he supplied. I was aware of the Tony Martin version, but Kent's mention of Bill Farrell struck a note. I looked into that further on the Internet, and even found a youtube posting of the entire recording by Farrell, with a picture of the MGM 45 rpm label that I remember so well! Farrell's single of "Circus" is the exact one that I recall playing as a deejay back in the late 1950s at a small radio station in Schenectady, NY, my first commercial job right out of the Air Force. It was a kick to hear it again! Again, thanks a lot ... and please pass my thanks along to Kent, too. UPDATE: Several FH Readers sent in copies of this one ... so here's YOUR chance to hear it now, too! According to Ron Smith's book "Eight Days A Week", on 11/19/1957, WCFL radio in Chicago bans all Elvis Presley records and is promptly picketed by the local Elvis Fan Club. Maybe you can ask one of your DJ friends who were around at the time about it. I've attached the Billboard magazine article about it. It was WCFL. Thanks for telling Frank my book must be wrong. By the way, you're right. You covered this four years ago -- and the same person asked the question. 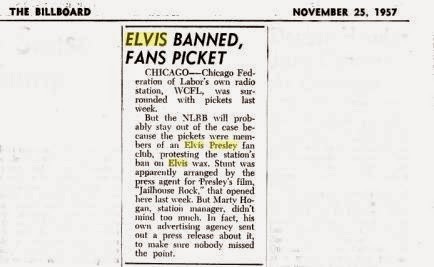 On 11/19/57 - WCFL radio in Chicago bans all Elvis Presley records and is picketed by local Elvis Fan Club. Sounds like an interesting story. Is there anybody you can talk to at WCFL to get more details ? station -- had decided to make hay by getting moralistic and banning the King altogether. Of course, if anyone had actually listened to the album they would have heard perfectly respectful versions of the gospel tunes "Peace In The Valley," "It Is No Secret What God Can Do" and "Take My Hand Precious Lord." Of all the stations in town who could have banned Elvis, it's true that WCFL doing so probably would have hurt him the least. I'm sure the Colonel laughed about it all the way to the bank. And when Elvis was drafted by the Army a few months later and served his country overseas, everything blew over. So there you have it ... again (apparently!) Didn't realize that we had gone this in-depth the first time around. Well, at least we're consistent!! !